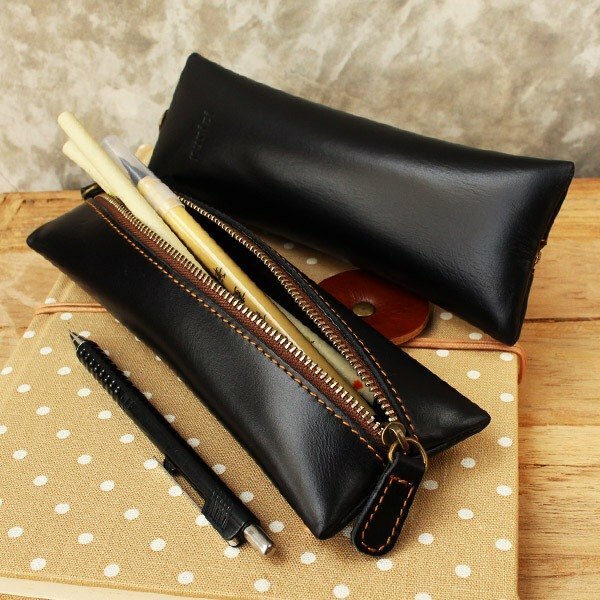 Simple and sophisticated design comes with leather craft technique make this Flat Pencil case a classic & timeless piece. it's also very functional with the open wide middle zipper. easy to get things in & out. ** you can fill 18 cm. long pen / pencil / scissors / ruler etc. in Flat pencil case. size : 7 x 20 cm. Color : Black **Please allow for some variation in color as displayed on different devices and screens. Actual colors may vary. Brown : https://th.pinkoi.com/product/wEs5kjAX?category=3 Material : Genuine "Oiled" Cow Leather with brown suede-liked fabric lining, YKK zipper Expected Delivery Date : For Taiwan , Hong Kong and Macau destination, your orders are estimated to arrive within 7-14 business days.